leading roles | special skills | performance reviews | recent career highlights | representing agents | retire this bad actor! Methyl Iodide has been ready to unpack his bags in California, but has largely been kept off the set for his cancer-causing ways. Only recently he appeared on the scene as a soil fumigant, registered in the final days of the Bush administration for use as a pesticide. Prior to his agricultural debut, he was used in industrial processes and laboratory research settings where, among other uses, Methyl Iodide was employed to induce cancer. His propensity to produce cancer has landed him a spot on California’s prestigious Proposition 65 List, and he’s associated with neurotoxic effects and thyroid disease. Methyl Iodide is currently taking method classes at the Ag Actors Warehouse and auditioning as Methyl Bromide’s understudy in California’s strawberry fields. BUILD/WEIGHT Organic compound, known as MeI, iodomethane, CH3I. Dense, colorless, volatile liquid. Methyl Iodide stars as the active ingredient in the product Midas, produced by Arysta LifeScience, alongside another known character chloropicrin, an acutely toxic pesticide and chemical warfare agent. Methyl Iodide was registered nationally for use as a soil fumigant pesticide in 2007, under the Bush administration’s US Environmental Protection Agency (EPA). Methyl Iodide has been auditioning as the replacement for ozone-depleting fumigant methyl bromide, which is being phased out globally. Methyl Iodide is currently being used in the strawberry-producing state of Florida, and a handful of others including Georgia, North and South Carolina, Maine, Virginia and Michigan, and most recently, California. 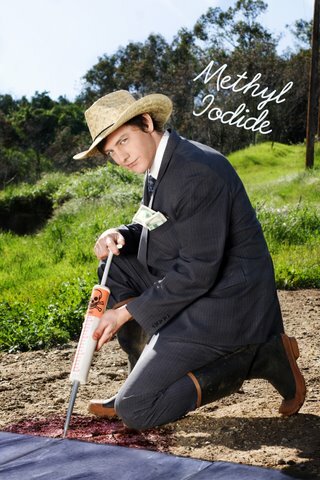 As of June 2011, Methyl Iodide has been used in one small farm throughout all of California. Listed as a known carcinogen under California’s Proposition 65 list, Methyl Iodide is so reliably cancer-causing that it is used to induce cancer in the laboratory. Methly Iodide is also known to cause late-term miscarriages, thyroid disease and both neurotoxic effects and spontaneous abortions (same as late-term miscarriages) in experimental animals and neurotoxic effects in chemists and manufacturing workers. In 2007, the US EPA issued a one-year registration for Methyl Iodide as a soil fumigant, despite a letter from 54 scientists including 5 Nobel Laureates expressing “astonishment” that EPA would even consider registering the highly toxic chemical for use in the open field environment. Behind the scenes, EPA’s registration of Methyl Iodide was quietly extended as the curtain came down on the Bush administration. Volatile Methyl Iodide is prone to drift, exposing farmworkers and rural communities to levels to up to 3,000 higher than regulatory bodies consider safe. Methyl Iodide is also a potential groundwater contaminant. Registration of this pesticide could put our scarce groundwater supplies at further risk. In September 2009, CA Department of Pesticide Regulation (CDPR) commissioned a scientific review panel to independently assess California’s risk assessment on the chemical. They found that this chemical can’t handle the spotlight. Unfortunately, in the eleventh hour of the Governator’s administration, Methyl Iodide was approved for work in California’s fields for the first time. The agency head who ignored her own scientists to approve Methyl Iodide for use in California, Mary-Ann Warmerdam, resigned and went to work for Clorox. At least that revolving door was an exit. Right now, the U.S. EPA is reconsidering its decision on letting Methyl Iodide get work in any state, despite intense pressure from Arysta LifeScience, the largest private pesticide company in the world, to keep it on the market. On March 17, 2011 the agency opened public comment on a legal petition to end all uses of this pesticide, nation-wide. The science is clear: this Methyl Iodide is too toxic to be used safely. But the pesticide industry will keep weighing in. In early 2009 Arysta LifeScience withdrew Methyl Iodide for registration in New York when the state went off industry script and started asking tough questions about environmental contamination and human health. The U.S. EPA is reexamining its decision to register Methyl Iodide for use — in the meantime, you can send a message to CA’s Governor Jerry Brown to reverse the decision for its registration in the largest strawberry-producing state. You can ask your retailer to sign the “Safe Strawberry Pledge” with Californians for Pesticide Reform. Download the Methyl-iodide Resume as a PDF here.